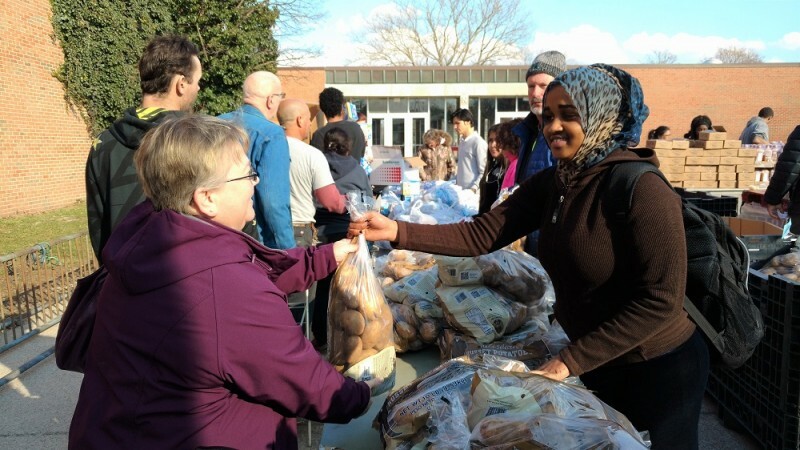 Union's refugee and immigrant students volunteer at Feeding America West Michigan's Mobile Food Pantries each month. If you need food and you visit the Mobile Pantry at Union High School, chances are the person who serves you will be a refugee. 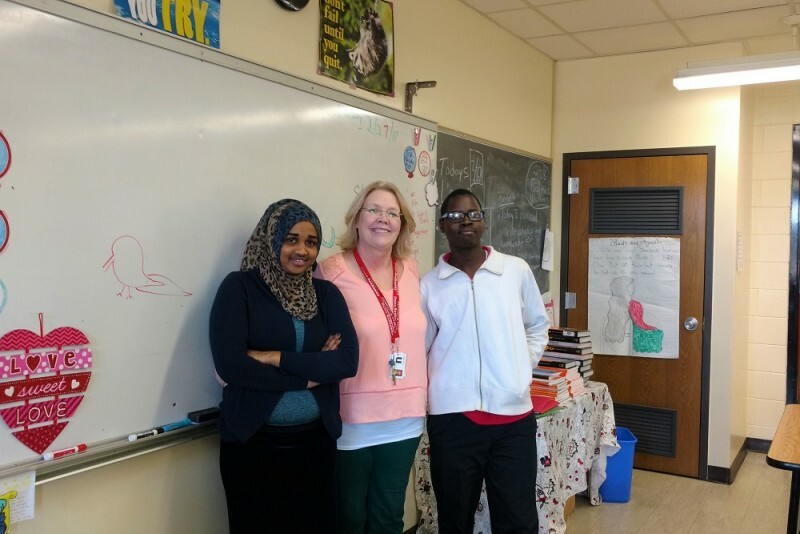 Refugee students, explains school improvement facilitator Halima Ismail, are at the heart of Union's partnership with Feeding America West Michigan. It started when a local benefactor offered free computers to refugee students if they completed a certain number of volunteer hours. With a computer, students can access programs like Imagine Learning, which provides literacy and math tutoring in their own language. One of those students is Abdelsalam Yaya. Yaya, who goes by his last name. is a 17-year-old from Habila, Sudan. After spending years in a refugee camp, Yaya, his parents and four of his siblings were approved for resettlement in the United States. They arrived last year. That’s where the computer came in handy. Ismail says that in just two months Yaya logged close to 100 hours on Imagine Learning, and he frequently stays after school four or five nights a week to finish his homework. But even after earning his computer, Yaya has continued volunteering at the Mobile Pantries. Senior Amina Abdullahi also volunteers at the Mobile Pantry distributions. Abdullahi recently applied to Grand Valley State University and, like high school seniors across the country, she’s anxiously waiting to find out if she’s been accepted. While she hasn’t settled on a major yet, she hopes to continue studying her favorite subjects, English and physics. Abdullahi grew up in the Kenyan refugee camp of Dadaab after famine and drought forced her mother to leave her home country of Somalia. The situation wasn’t much better in Kenya, it turned out, where getting enough water to drink, let alone bathe, was a challenge. So in 2013 at the age of 14, Abdullahi and her mother moved to the United States. Needless to say, moving to America was an adjustment. In her long blue dress and hijab, Abdullahi stands out. But clothing proved to be a cultural barrier in another way. She recalls how, a few days after moving to Grand Rapids, one of her neighbors answered the door wearing a Halloween costume. “For three days, I not come outside,” Abdullahi says. American slang also threw her off early on. An observant Muslim, Abdullahi remembers how in eighth grade she asked her fellow students if the meat they were serving in the cafeteria was pork. It turned out to be chicken. While Yaya usually brings home a little food from each Mobile Pantry for his family, Abdullahi can’t. Hauling 30 pounds of food on the two buses she takes to get home just isn’t practical. They manage, though, because her mother works and gets some help from the Supplemental Nutrition Assistance Program. Union’s refugee population is sizeable, 125 students out of a total student body of roughly 1,200. In fact, Union is currently increasing the staff for its newcomer program, which serves refugee and immigrant students, from two staff members to five. A recent increase in the resettlement of Congolese refugees to Grand Rapids has contributed to the growth of Union’s refugee population, says Nathaniel Harrison of the Refugee Education Center, which coordinates services for refugees with GRPS, Bethany Christian Services, Samaritas and others. The availability of manufacturing work has long made Grand Rapids attractive to refugees, but social support from the existing refugee population is another powerful draw. “When families are being resettled, [agencies] always look for a tie, like a family member, so they can receive that extra support,” Harrison says. That was true for Abdullahi, whose older brother settled in Grand Rapids in 2006. In the last two months, however, the U.S. stance toward refugees has shifted. 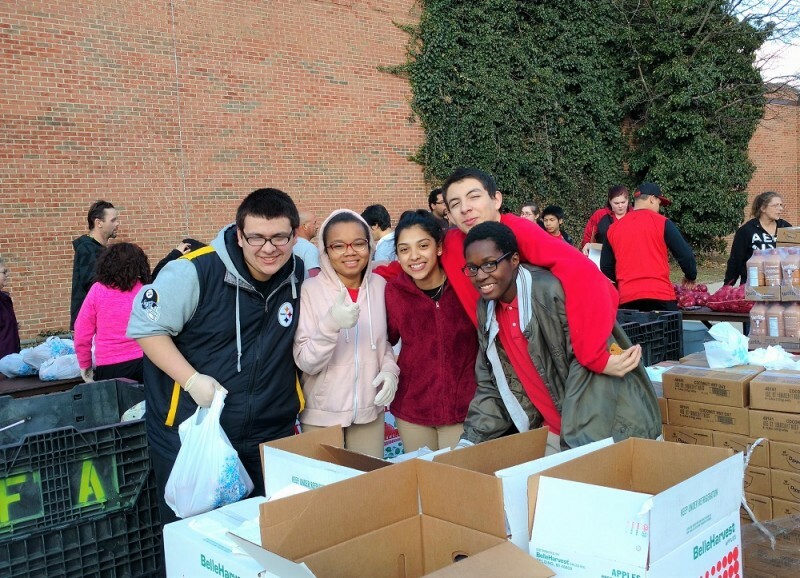 For their part, Yaya, Abdullahi and their classmates continue volunteering at Union’s Mobile Food Pantries month after month, making sure every neighbor who comes to them for help goes home with a box of food, no matter where they came from.